Does science and technology (S&T) truly have a part to play in meeting basic human needs? Can S&T help the world's communities secure adequate nutrition, health care, water, sanitary facilities, and access to education and information? The role of science and technology in development is certainly one of the most complex and delicate issues facing policymakers and development practitioners today. 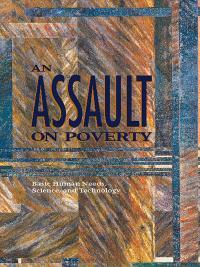 In An Assault on Poverty, the Panel on Technology for Basic Needs of the United Nations Commission on Science and Technology for Development offers analyses of poverty eradication and the role of S&T with respect to sustainable human development, technical and vocational education, health, and small-scale economic activities, among other issues. The panel's findings reaffirm that S&T does, indeed, offers great potential in eradicating poverty. Realizing this potential will, in the words of panel chair Arnoldo K. Ventura, depend on "social and political will, sufficient moral purpose, enlightened self-interest, and acceptance of the unity of all members of the human family and its precarious position on this planet." The United Nations Commission on Science and Technology for Development was established in 1992 by the Assembly of the United Nations and, since 1993, has been serviced by the UNCTAD secretariat. Through assembled panels of experts, the Commission examines and provides advice on current issues in science and technology, with a focus on the developing world. The Commission's Panel on Technology for Basic Needs was convened to explore how science and technology could contribute to the alleviation of poverty and the fulfilment of basic human needs.